Crepey skin happens when your skin looks wrinkled and thin. The misconception is that crepey skin is contributed to old age, this isn’t always the case. While it’s more common in older people, it usually starts for those in their 40’s. A common cause of crepey skin is ultraviolet (UV) radiation through sun or use of tanning beds. The UV radiation breaks down the elastin fibers in the skin which doesn’t allow the skin to stretch and return to it’s normal position. Crepey skin is commonly noticed in your neck, shoulders, back, chest, elbows, knees and hands. Unlike wrinkles that are prone to areas of the body where there is repeated motion such as your eyes and mouth, Crepey skin problem areas are due to no longer having elasticity that allows the skin to return to the normal position. You have many options when it comes to Crepey skin. At SkinRenew we offer the following services to address problem areas most prone to Crepey skin. SkinRenew Laser Medical Center is proud to announce that we are seeing great results with Micro Needling and Growth Factor infusion. Understandably, our patients get excited when they learn about these proven anti-aging techniques. To help you get the best results, we are now scheduling Micro Needling and Growth Factor Infusion sessions with Dr. Kwon. Popular with celebrities and many women who have past the age of 40, what makes Micro Needling so unique is that it uses the body’s own natural growth patterns and processes to return to a more youthful image. Micro Needling is an effective technique that uses tiny needles to penetrate the top layers of the skin’s surface. Micro needling increases the body’s natural formation of new tissue, allowing the body to naturally produce more collagen and elastin in the treatment area. The results of the body’s collagen and elastin deposition makes the skin appear more plump and firm; reversing visible signs of aging. When patients undergo the Micro Needling treatment, it feels like sandpaper is being rubbed across the skin. That is because the needles are creating controlled micro-injuries to the skin, which expedite the body’s own healing process. Micro Needling does not break down the outer layer of the skin, which means there is no scarring, and a there is a quick recovery time. The beauty of Micro Needling lies in the fact that the body naturally heals itself, producing better results in creating fresher younger skin that glows. Studies show that Micro Needling is found to be safe and effective, creating visible results that makes the skin appear more youthful. Now that you understand Micro Needling better, let’s take a look at Growth Factor Infusion. Growth factors are the proteins secreted by your body’s own cells that help the healing process. These growth factors include keratinocytes, fibroblasts and melanocytes that make up the top layers and the underlying layers of the skin. Growth factors help repair wounds, promote the formation of collagen, and help generate new, healthy tissue. As we age and our skin ages, our bodies tend to produce lower levels of natural growth factors. When our bodies produce smaller quantities of natural growth factors, we begin to see sagging skin, more fine wrinkles, deeper laugh lines, and deeper creases around the nasolabial folds. By supplementing the body with collagen treatments, hyaluronic serum, topical skin care treatments, and other skin care products infused with growth factors, we can stimulate skin tissue regeneration, which reduces the appearance of these telltale signs of aging. Many people older than the age of 40 seek out anti-aging skincare treatments that will allow their skin to look younger, more elastic, and softer. Growth Factor Infusion helps the skin appear smoother naturally. With continuous treatment, Growth Factor Infusion may stop or reverse the aging process. To maximize the effects of these two skin care treatments, Dr. Kwon uses a method of infusing Growth Factor and Hyaluronic Serum into the skin while Micro Needling. The power of using both anti-aging techniques are highly effective at skin rejuvenation, working with the body’s own natural processes to give skin a healthier, youthful glow. The effects on our patients’ skin are nothing short of amazing! If these techniques are new to you, you need not worry if they are safe and effective, for Dr. Kwon is ahead of the curve and she has successfully been using Micro Needling techniques for over 8 years. The average age of patients that have utilized this treatment is 40 and up, and many have been absolutely thrilled with the results. Not only does their skin appear younger, but also their confidence often increases, knowing that they look almost as young as they feel. If you are interested in learning more about Micro Needling and Growth Factor Infusion, contact SkinRenew Laser Medical Center for a consultation. You may call us at 209-526-2200, or contact us online. We look forward to showing you the amazing results of this skin renewal technique, as well as our other services. What do you want to correct about your skin? Are you concerned with uneven skin tone, dark spots, fine lines or redness? The good news is that the most effective anti-aging ingredients (prescription retinoids and retinols—both vitamin A derivatives) target skin texture, hyperpigmentation, and lines and wrinkles for younger and healthier looking skin. Retinoids and sunscreen offer a one-two punch in fighting signs of aging. But sometimes this duo is not sufficient to diminish discoloration or hyperpigmentation that has resulted from sun exposure. Used for the past 50 years to treat pigment concerns, hydroquinone remains the gold standard for reversing dark spots, melasma, and uneven complexions. 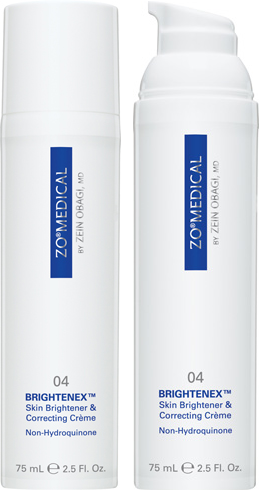 ZO Medical Melamix™ contains 4% hydroquinone and is available by prescription only through SkinRenew. ZO Medical Melamin™ also contains 4% hydroquinone, but with the addition of vitamin E to fight free radicals and repair damaged cells. Dr. Obagi recommends that you only use hydroquinone under medical supervision because of potential side effects, such as irritation. Many alternative skin lightening products have been developed. For example, ZO Medical Brightenex™ uses a blend of retinol, melanin inhibitors including soy, and antioxidants to brighten skin. Dr. Obagi often recommends using Brightenex™ after Melamin™ for optimum results. Chemical peels also work to brighten complexions and diminish the appearance of dark spots. The Apeele chemical peel www.apeele.com is an in office procedure that causes some redness, peeling and flaking—enough to let you know it is working—resulting in a clearer complexion. If you can spare the downtime—up to one week of extreme redness and extreme peeling—an Apeele chemical peel will reveal a new layer of undamaged skin with smoother texture, less lines and wrinkles, and more even skin tone. No matter what condition you seek to correct, SkinRenew has the right solution for your skin. As we age, our bodies’ natural ability to heal and renew itself diminishes. Over time, our skin becomes less and less resistant to the damaging effects of the sun’s rays, leading to discoloration. On top of our naturally occurring lines and wrinkles, this discoloration can make you look significantly older than you are. Skin discoloration from sun exposure occurs due to the overstimulation of melanocytes. Melanocytes are specialized skin cells that produce melanin, which makes the skin darker in response to sunlight in order to protect you. Over time, the mechanisms that control these melanocytes break down or become damaged, resulting in permanent melanin production—this is the source of dark spots and permanent skin discoloration as we age. These dark spots are called solar lentigines, and can also be referred to as age spots, sun spots, or liver spots (though they have nothing to do with the liver). Above everything else, the absolute best way to avoid discoloration, uneven skin tone, and dark spots is to avoid the sun. There’s no getting around it: the sun’s UV rays damage and age our skin. Their cumulative effect over the years may not be noticeable now, but the end results are undeniable. With too much exposure, you could end up looking 10 years older than you are. The only 100% way to keep your complexion looking young is to protect yourself from the sun. Avoiding prolonged exposure, wearing protective clothing, and using broad-spectrum sunscreen with UVA and UVB protection are the best ways to do so. Even if you don’t think you’re getting too much sun, you most likely are. Around 90% of fair-skinned individuals over 60 develop dark spots from cumulative sun exposure. Keep yourself safe and keep your skin healthy! The good news is that you can fight back against the discoloration of your skin. There are different ways to fight the effects of dark spots, with the most common being the exfoliation of the outermost skin layers to remove the pigmentation. 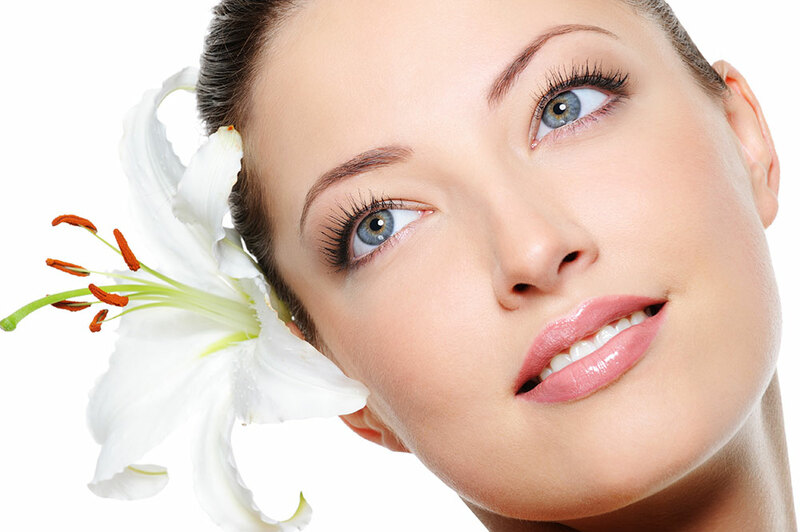 This is accomplished through various methods, including microdermabrasion, chemical peels, and laser resurfacing. While these methods do improve the skin tone and possibly texture, there are topical treatments that can be used in conjunction with these methods to improve their results. These products may even reduce the discoloration enough on their own. Hydroquinone, a chemical that disrupts the function of melanocytes, acts by directly reducing and reversing pigmentation. Hydroquinone can be found in over-the-counter products, but with a lower concentration than in prescription products. Remember, when you use any product that’s designed to lighten your skin, it’s imperative that you use sunscreen daily. Melamix™ Skin Lightener & Blending Crème: this cream contains 4% hydroquinone and works in a gradual fashion to reverse discoloration. Melamin™ Skin Bleaching & Correcting Crème: also containing 4% hydroquinone, this cream works similarly to fight hyperpigmentation. Brightenex™ Skin Brightener & Correcting Crème Non-Hydroquinone: for those that have reactions to hydroquinone, this product contains 1% retinol instead. Though it’s most common in teenagers and young adults, acne can affect anyone at almost any age. Because it can be caused by so many different things, fighting it can at times seem hopeless. Pinpointing the exact causes and focusing your efforts to combat them is exceedingly difficult for some people. From genetics to diet to hygiene to stress, the source of your acne can be an agglomeration of issues. While you may be doing everything you can to combat one issue, another may be just as detrimental to the health of your skin. Any completely successful acne treatment recognizes that each individual’s acne is caused by a unique set of issues—it is therefore necessary to custom tailor the treatment to the individual. However, despite the varying causes of acne, the mechanisms by which it occurs remain the same. Combinations of dead skin cells, oils, dirt, and bacteria in the pores of your skin create cocktails that irritate the skin. Most of these things pile up when your skin doesn’t exfoliate properly. Dead cells, overproduced oils, and foreign contaminates can mix inside of pores, causing them to become clogged. When your pores become clogged, the results are the all-too-familiar whiteheads and blackheads. Inflammation and irritation are only exacerbated by bacteria, making unsightly blemishes stand out even more. Dr. Zein Obagi has dealt with his fair share of acne cases. Dr. Obagi says that the treatments you can commonly find in drug stores “can actually perpetuate the condition.” Supposedly ‘oil-free’ cleansers can contain synthetic oils that do more to damage your skin than they help repair it, depending on your case. Similarly, moisturizers often have pore-clogging agents that actually trigger acne. That’s where Dr. Obagi’s line of skin care products comes in. ZO® Skin Health by Zein Obagi MD is designed to break the cycle of acne, healing your blemishes and preventing new ones from forming. The Acne Prevention +Treatment Program offers three acne-fighting products alongside a Bio-Sulfur Masque. Cleansing your skin of dead skin cells is a critically important part of any acne treatment regimen. Offects Exfoliating Cleanser targets these dead cells specifically, reduces excess oils, and neutralizes free radicals. Micro beads inside the cleanser exfoliate your skin, leaving it smooth, soft, and clear. Despite your best efforts to cleanse your skin on a regular basis, the relentless buildup of dead skin cells can continue. Keeping dead skin cells from building up is the key to keeping your skin healthy and blemish free. Offects Exfoliating Polish is used twice a week, helping to remove that buildup of dead cells and promote the skin’s healing process. The polish works through the gentle and powerful exfoliating properties of round magnesium crystals, leaving your skin clean and refreshed. The Bio-Sulfur Masque is a powerful tool in the system’s arsenal, further preventing the buildup of excess sebum. The masque is only to be used once per week, providing the skin with calming chemicals that help fight the appearance of acne. This masque is available exclusively in the ZO® Skin Health Acne Prevention + Treatment Program. Melasma is a skin condition that many have seen or experienced, though few have ever heard its name. Seen most often in pregnant women and often referred to as the “mask of pregnancy,” melasma is a condition that causes dark blotches to appear on the skin. It can affect anyone, but is most common in women and is thought to be brought about by surges in certain hormones. Melasma is mostly a cosmetic issue, and how much treatment it requires depends upon how much the individual wants to avoid the dark patches. The most difficult part of melasma is that there is not a cure available. The dark spots on the skin can only be treated temporarily to varying degrees, depending on certain factors. There are two types of melasma: epidermal and dermal. Epidermal melasma appears in the top and middle layers of the skin and is generally lighter. Dermal melasma is a deep pigmentation of the skin, and is more difficult to conceal or treat. The longer a patch goes untreated, the darker, larger, and deeper in the skin it will become. For this reason, it’s best to keep an eye out for melasma and to begin treating it early. Melasma is also worsened by exposure to sunlight, so it’s best to use strong, broad-spectrum sunscreens with additives like titanium dioxide and zinc dioxide. The patches can be difficult to cover with makeup, and will only get more difficult over time. The patches spread wider and grow deeper as time goes on, meaning that makeup only works so well for so long. On top of this, the patches appear asymmetrically on the face, making concealment even more difficult. Patches can appear in different places, and depending on your race and whether you’re a man or woman you may be predisposed to melasma patches in certain areas. At SkinRenew we know that many, many women are affected by melasma. Seeking treatment is the best thing to do if you want to avoid darker patches later on in life. We have a variety of treatments available to aid in lightening melasma and making it more easily concealable with makeup. Both chemical peels and microdermabrasion can be effective ways to lighten the patches. Skin care products that contain hydroquinone are used to bleach, hydrate, and exfoliate pigments that have been pushed up to the top layer of the skin. SkinRenew also uses products from ZO Skin Health to effectively combat melasma. Laser treatments are also available and can be quite effective. Ongoing treatments include combatting free radicals with liquid antioxidants, normalizing hormones so that further pigmentation is avoided, and daily use of strong sunscreens. Dealing with melasma is about continually protecting and maintaining your skin. We understand that dark blotches on the skin can be embarrassing and can make you feel self-conscious—we have firsthand experience. Combat melasma early and visit us to find out more about which treatments are right for you. Unwanted body hair can be annoying and difficult to manage. For some people—especially women—troublesome areas of body hair can be extremely embarrassing. These areas can cause worry and affect one’s self confidence. It’s no wonder, then, that laser hair removal procedures are as popular as they are. In the US alone, well over 1 million procedures took place in 2012. In total, over 900,000 patients underwent laser hair removal that year. That makes laser hair removal the third most popular non-surgical cosmetic procedure, behind only hyaluronic acid and BOTOX. With the continued increase of social acceptability for cosmetic procedures, it’s no wonder these industries continue to grow every year. However, there’s another reason that contributes greatly to the increasing popularity of these procedures: safety. As technology and science advance, procedures like laser hair removal only become safer and more readily and cheaply available. Laser hair removal in particular is an extremely safe procedure, with very few common side effects. The full list of side effects ranges only from the superficial to the mildly annoying. The key thing to remember after a treatment is to keep the treated area out of the sunlight. Laser hair removal works by exposing the hair follicle to pulses of laser light, which destroy the follicle. The destruction is permanent and results in the permanent removal of unwanted hair, unlike many conventional means of body hair management, like shaving and waxing. In general, the laser light treatment is only effective during a certain phase of hair growth, called the anagen phase. The anagen phase is the phase when the hair is actively growing, is thicker, and is more pigmented. Because of its darker pigmentation during this phase, the hair serves as a better target for the laser light. There are two other phases of hair growth called catagen and telogen, where the hair stops growing, eventually sheds, and rests before beginning the anagen phase again. During these two phases, laser treatment is not as effective, as the hair follicle is relatively immune to the laser light. Due in part to these phases, multiple laser hair removal treatments are required for the best possible results. You should expect to undergo more than one treatment and, depending on the degree of removal you want, many treatments may be necessary. The good news is that the procedure is relatively pain-free. Though everyone has different pain thresholds, the laser pulse is generally reported as a brief sensation of heat, the snapping of a rubber band against the skin, or the slightly more noticeable sensation of spattering hot bacon grease. Since everyone’s hair grows at different speeds and hair from certain parts of the body grows faster than hair from other parts, each set of treatments is tailored on an individual basis. Chin and upper lip treatments may happen in quicker succession. No matter where the treated area is, though, patients usually report that hair regrows slower, is finer, and is sparser. Laser hair removal is one of the safest cosmetic procedures and can have very effective results. Ask about all of the associated risks and side effects to make sure that the procedure is right for you. APEELE™ is a next-generation revitalizing peel designed to provide controlled exfoliation of damaged skin with significant visible results after just one treatment. This powerful yet non-invasive chemical resurfacing procedure uses a synergistic combination of multiple active ingredients to improve the quality and appearance of facial skin. APEELE™ achieves a smoother, tighter and younger-looking face without surgery, injections or significant downtime. Experience a visible transformation of your skin with APEELE™. many ways to attempt to treat them and reduce their prominence. BOTOX, being so powerfully effective and simple to use, has quickly become the most popular treatment for facial wrinkles. In fact, BOTOX is so effective at what it does that it has actually become the most popular cosmetic surgical treatment. In the United States alone, millions of people have received BOTOX treatments. In 2012 alone, there were over 6 million BOTOX procedures administered. Its generally favorable results combined with its quick, non-invasive procedures have ensured BOTOX’s continued growth in the cosmetic treatment industry. BOTOX is actually a contraction of botulinum toxin, which is the chemical that makes BOTOX treatments so effective. While it may at first seem scary to inject a toxin into the body, BOTOX treatments have proved time and again to be safe, with minimal, short-term side effects. The most common side effects include things like headache pain, temporary eyelid droop, nausea, and some bruising at the injection site. medication or injection we put into our bodies, there are known and unknown potential side effects and complications. Everybody is different and reacts in different ways to differing amounts of different chemicals. To be sure BOTOX is right for you, you should not hesitate to talk to a doctor and learn as much as you can about the procedure. When the toxin is injected, it is in a highly diluted form. Injections are customized for every patient, as every patient has unique needs. BOTOX works by producing a temporary paralysis of the facial muscle that generally lasts about two to four months. Paralyzing the muscle softens the lines and wrinkles in the face, leaving the patient looking younger. Patients see results over the following two to fourteen days. Since the effects are not permanent, patients usually get renewal injections once the effects of the last procedure begin to diminish. It may seem like an intense way to keep yourself looking younger, but BOTOX procedures have helped many people be happier about their appearance. Beauty is subjective, but it can be very important to look beautiful to yourself. Being happy about your body can positively impact many different areas of your life. In the end, you have to decide for yourself if the procedure and its risks are right for you.